LUCKYDIY Solar Fountain, Solar Powered Bird Bath Fountain Pump 1.5W Solar Panel Kit Water Pump Small Pond Garden and Lawn | Fountain City Art Ctr. the water and has no electric outlet or external battery. Mosquitoes will not lay eggs in moving water. outdoor bird bath, fish tank, small pond, garden decoration, water circulation for oxygen. Maximum delivery height: 18", Regular:10~15"
2. Don't make the submersible solar water pump work without water for a long time, or its lifespan will be shortened. LUCKYDIY provides 30 days Free Return, 6 months Warranty and kind customer service. If you have any confusion, please feel free to contact us. Welcome to LUCKYDIY, if you have any confusion about us, don't hesitate to contact us and we will try our best to serve you! 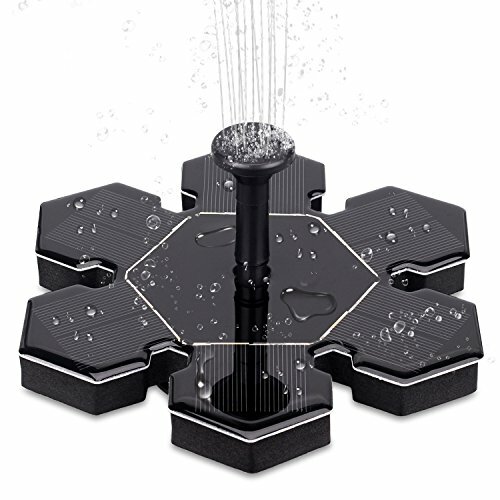 CONVENIENT FUNCTION DESIGN --- Simply cleaning, easily move to different locations, no plugs required, small, multiple fountain heads for different water patterns. Just floating it on the water, it will run automatically once the solar panel reach enough sunlight. PRODUCT ADVANTAGE---Super quite and high efficiency submersible water pump which is strong fastness to solar panel, disassemble and easy for cleaning. GIFT---Good idea for gifts to friends, lover, parents ,children ,relation ,etc. This solar fountain would brings you a great surprise. WHAT WILL YOU GET--- One solar fountain pump with all parts, user manual, 100% warranty and friendly customer service. If you have any questions about it, welcome to contact us. If you have any questions about this product by LUCKYDIY, contact us by completing and submitting the form below. If you are looking for a specif part number, please include it with your message.